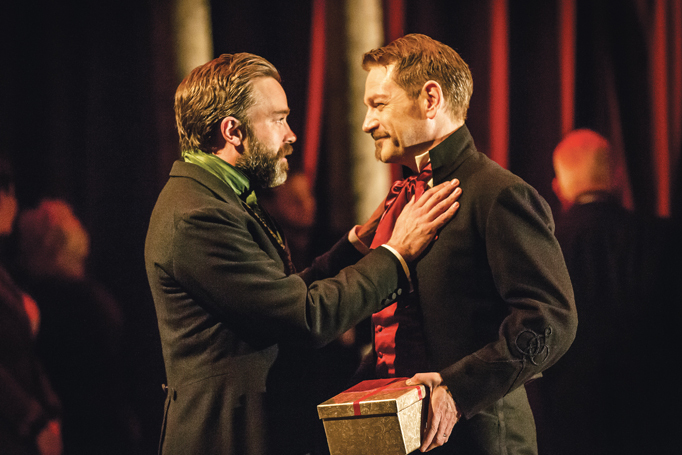 The Kenneth Branagh season is a continuation of the concept in the two Michael Grandage Seasons in the West End … in the first of which we saw Branagh play in Ivanov. We have booked right through to next September … you don’t think about it pressing BUY online, as it’s been so hard getting through in the first place, but the total for the five productions was a serious shock, especially as we could only get evenings for the early ones, which means a hotel too … normally we’d drive back but the current M3 roadworks with nighttime diversions add an hour to the two and a half hour journey. I hadn’t realized the very long preview period … close to the Cumberbatch Hamlet level, and also, unlike the RSC or Globe previews, not at a reduced price. £95 would be cheap indeed for Broadway, but not for England – it is over four times the “3 for 2” price of Henry VI at the Rose Theatre last week, which had young rising stars Alex Waldmann and Robert Sheehan and a huge cast. I understand the price to a degree – the tickets are highly prized and the scalpers will be circling and charging considerably more, so that is the market value. It’s a conundrum for a blogger. Directors will say they tweak during previews … or radically change order in the case of Cumberbatch’s Hamlet. In the Sunday Times Culture interview (8th November) Judi Dench talks about the luxury of being able to refine and tweak the play. Having seen a couple of plays this year and last twice, and early and late in the run, they do change bits. On the other hand, in both cases we thought the earlier performances were actually better. I’ve done lights on long variety runs … two months at two shows a night, six days a week … and I know how things shift with comedians and sketches … but very often the early excitement and tension add something more important than the later polish. At full price with a highly experienced team, you would not anticipate major changes. For the amateur reviewer, I think it fair to comment on early performances. If you want to use the preview period as a rehearsal, you should price accordingly. It could be that the long preview period is because they don’t want to reveal the sets with the necessary photos too soon. No “set spoilers”? Certainly reviews won’t lose them any custom as this play is virtually sold out. I always thought Broadway was reluctant to admit reviewers until they’d shifted sufficient advance tickets. It certainly doesn’t apply here. However, I’ve held this review back until press night, on November 7th. It is playing in repertory with All On Her Own and Harlequinade with most of the same cast. We start off with the Sicilia court of Leontes as Christmas, with a Christmas tree in a sleigh, and everything is in rich crimsons, and the set feels quite tight and confined. It pulls back for the “shores of Bohemia” to a pale blue projected sky and the pillars retreat so that it feels wide and open. Rough wood sheep pens frame the rustic Bohemia set in part two, and it’s noticeable that the “extras” if I may call them that, eventually form a background, hazed with dreamy dry ice (or the modern equivalent) with clear lighting at the front. Then we return to Sicilia, and we find we’re in Frozen or The Snow Queen territory. The whole court is frosted silvery white. Leontes beard and hair are frosted silver. Paulina has gone from grey to white. After high concept versions, this is low-medium. Nothing extraneous has been imposed on the story, no extra references. We’re in Edwardian dress throughout, which works. I found it a “straight” but highly atmospheric version and it was fascinating. They did just what Trevor Nunn got criticized for in the Wars of The Roses, and they got a standing ovation for it. In other words, RP clear delivery. A classic style for the main speeches, straight to audience for Hermione’s long plea. Accents only when needed by the role … so Mummerset for the rustics and Perdita; a slightly embarrassing Fagin for Autolycus … not that it didn’t work, as we all know ‘gotta pick a pocket or two.’ There were no actors just using their natural accents at will. I heartily approve. Beautiful deliveries all round, though I thought Perdita lost her Mummerset while sailing through Austria to get to Sicily from landlocked Bohemia. Branagh dares to use the full range of his voice and go quieter than anyone else in some passages. Then his loud is really loud. When he went quiet he was never inaudible. The pre-Great War setting was richly festive for the Christmas beginning … most productions ignore the title, “The Winter’s Tale.” Branagh gave us tinkling music box sounds before the curtains opened, and snow descended gently all over the stalls (I bet those cleaning up curse him, but it wasn’t as bad as the people near us who just got up and left at the end, abandoning long stemmed wine glasses on the floor.) The immediate feeling was that we were entering “Storyland” rather than “Sicilia” or “Bohemia”. Then much was made of present giving. Leontes’ present was a little glass dome snowstorm, which he turned and shook, forming the motif for the whole play. Hermione gave Polixenes a pair of skates, and in an excellent touch they skated blithely and innocently back and forth across the snowy background while Leontes worked himself up front stage into his frenzy of suspicion and jealousy. In the Christmas scene, they all watched a grainy black and white silent film of lads in sailor uniforms … I suppose it was meant to be Leontes and Polixenes, though the son, Mamillius was in a Victorian boys’ sailor suit too. As the mother of three children, my companion was highly critical of the very pregnant Hermione carrying her son, Mamillius, piggy back … was he seven? Eight? Nine? As she said, it is physically impossible with that big a belly, proving no one had much experience of late pregnancy. This is the play where a stage direction is the best-known line. It was lampooned in the Sunday Times last weekend in the tale of would-be stowaways in France boarding a truck, and finding that it contained a polar bear, which fortunately did not attack or devour them, making them luckier than Antigonus at the end of the first part. I assume it was sedated for the journey. The Sunday Times headline? EXIT (PERUSED BY A BEAR). The bear here was a projection (again), first big, then projected on the front semi transparent screen so HUGE. The front screen was also dropped over the set for that odd moment when Shakespeare decided to fast-forward through the story by having four men report how they all discovered that Perdita was Leontes lost daughter, abandoned on the beach of Bohemia to die, and it all turned into happy families. Shakespeare just skipped a great revelation scene. Maybe The Globe was getting complaints about over-running, and patrons missing the last rowing boat home to the north bank. Maybe he thought, ‘I just can’t write yet another of those explanation endings.’ Maybe he wanted to cut to the statue scene without undermining the surprise. It reminded me very much of pantomime, when the screen or curtain drops, and the comedian (Buttons or whoever) entertains the audience in front of the curtain while the stage is set for the finale and everyone gets dressed in their finale costumes. Or in The Winter’s Tale, they set up the “statue” of the long dead (so they suppose) Hermione. Whatever you do, it is an odd play. The first half is unremitting tragedy ending in death by ursine devouring. Then the second half is song, dance, trickery and rustic fun and games and romance. Our central character, Leontes, just disappears until the final scene, which means the role is a canny choice for an actor / director, who can stand out and watch a large part of the play, while still playing the lead. Hermione is long gone anyway, and Paulina, promoted in focus here to the major female role (as befits Dame Judi Dench), is out of it too. It’s virtually a different play with a different cast after the announced 16 year time gap. 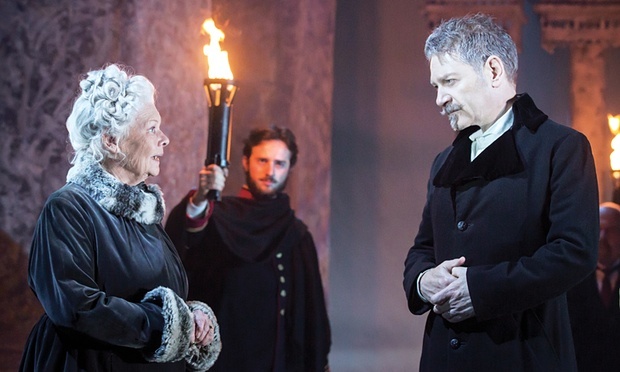 In a sensible move, having Judi Dench available, the Act IV prologue speech by “Time” explaining the shift in years was given to Judi Dench in character as Paulina. Throughout music was used well behind speeches. In the rustic Bohemia part, songs by Autolycus (John Dalgleish) were captivating. 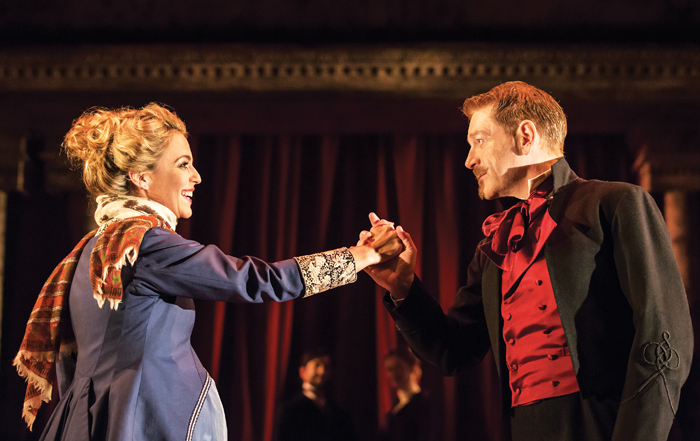 The song and dance was fine choreography, the most interesting and wildest dance reminding us of the stylised dance sequence in the film Anna Karenina. 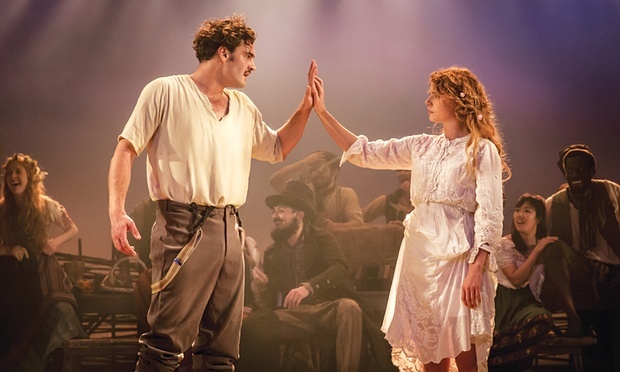 Jessie Buckley was an outstanding Perdita. She looked perfect, she danced well, and the Mummerset was charming (even if it did get lost a bit when she regained her rightful place as Princess). They brought out the sensuality … she had a wispy muslin skirt, and the lads stripped to the waist in the dances. Tom Bateman, after the lead in the long running Shakespeare in Love plays a splendidly masculine Florizel. Bateman (Shakespeare in Love, Duchess of Malfi) and Buckley (Henry V, Amadeus) have both had a very good couple of years, and indicate the quality of the acting strength Branagh can draw on. Audience response? 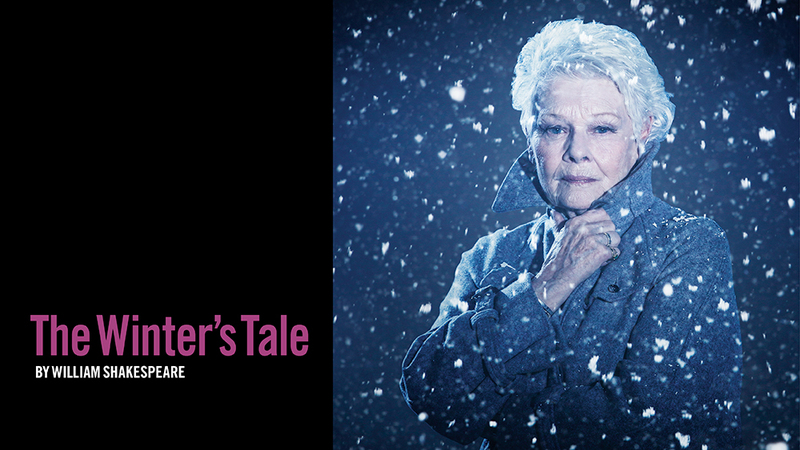 An ecstatic standing ovation, as would be expected for Sir Kenneth Branagh with Dame Judi Dench with such a fine cast. All credit to both stars for staying in the line rather than taking separate bows. I noticed some fine “back acting” from Branagh, as when during part of Hermione’s long speech in defence of herself, he stood upstage, back slightly hunched, back to the audience, stock still. On being still, everyone in the audience watches Hermione as a statue for the slightest twitch, and she never moved a muscle. That’s what we were all checking for … and I think they did that scene at full length too. I would have been so tempted to have Paulina throw a coin down to get a sudden movement … OK, it would have destroyed the scene in hilarity, but after a day passing the statue mimes of Covent Garden, it does cross the mind. The production is part of the trend for having virtually the whole male cast full-bearded. It’s arguable for 16th century plays, but voluntary for the 19th when this is costumed … they had decent razors and barbers by then. I don’t like it. It conceals facial expression and makes the men look too similar. Branagh’s tiny triangular beard looked fine silvery, but when gingery earlier it looked unbecoming. In the end, I thought it a very clear rendition of the play, meticulous directorial attention to detail, with famous actors performing at the highest level, and it created a crackling, entrancing sense of atmosphere. The snow motif, as on the posters, was an important part of that, and the lighting design (Neil Austin) deserves an award. 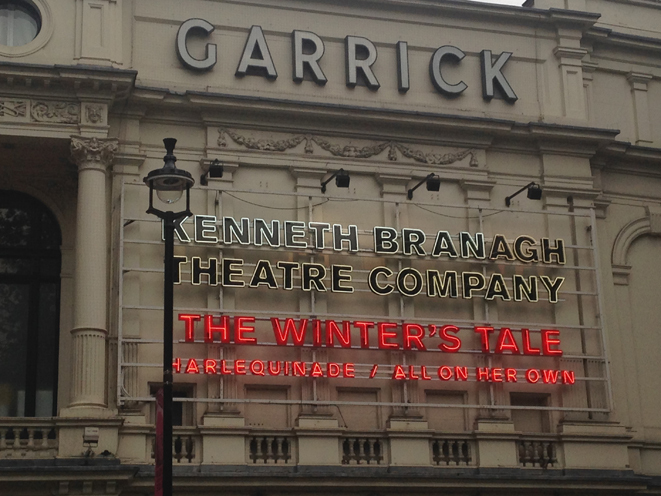 Overall, I still prefer the magical setting of the last RSC production of The Winter’s Tale (see link). This play is in repertory with Harlequinade and gets a combined £5 programme. Same cast. Same production people. That always adds interest, but I’d rather have had two separate £3 programmes even though we have tickets for both. You get just the one essay on each play and lots of adverts and long credits for everyone involved. I have a shelf of RSC, Globe and National programmes. This won’t be joining them. There are free cast sheets, as at the RSC, an excellent move. Also, I don’t like the cast list in the programme. It simply lists names, “Leontes” where I would put “Leontes, King of Sicilia” and “Florizel, son of Polixanes.” Not everyone knows The Winter’s Tale in detail. The RSC and The Globe would both have given a short synopsis. As with the Grandage Season, where I said it several times, I must remark yet again that London needs a modern purpose-built COMMERCIAL theatre for this sort of independent production. The Arts Council assisted theatres have their own agendas, with no space for an independent to come in for a full year’s work. These old West End theatres with their fixed square on proscenium stages are just not a match for the Olivier at the National, Chichester Festival Theatre, The Rose Kingston, The Globe, the transformed into the round Old Vic, The Young Vic. Nor for the better modern provincial theatres like Salisbury Playhouse or Milton Keynes. Poor rakes. Poor sight lines. The facilities fail dismally too. Awful loos, only reached by weird convoluted routes through the auditorium. Cramped and crowded public areas. Apparently the theatre was freshened up and repainted for the season. However good the production and direction is, proscenium stages just cut off and distance the action. You’d think they could demolish one of the larger ones, retaining the facade if need be, and build a new modern space behind. Nearly every London theatre has a note that there is no readmittance for those who leave during the production. Everyone knows that, but having everyone being stopped and told it personally on the way in was extremely “unwelcoming.” Apparently it was at the insistence of “the producers.” Everywhere else manages without such stringent personal warnings. It didn’t happen at Harlequinade a week later, so perhaps they dropped it. A few notices and a line printed on the ticket should suffice. It wasn’t as bad as Art Garfunkel a few years ago who had put personal handwritten signs on every entrance with a similar request. And he signed them. i.e, autographed them. Of course they all disappeared very quickly. It was SO hard to get seats. Yet weirdly four people in our row left at the interval as did two further forward. The two next to us were not native speakers. I don’t know about the two further along. Watching them go, confused, it’s certainly not a criticism of the production. I remark yet again that there are a lot of people with enough money to obtain REALLY hard-to-get expensive tickets, yet leave at half time. It’s a Central London phenomenon, repeated in most West End productions. Mainly they seem to be foreign visitors who won’t be able to understand much. It’s annoying in that I know several people who were so desperate to see this and couldn’t get tickets. The “deserters” haven’t crept south of the river in numbers yet.